The trading position has been trapped as long as the price rises and falls dramatically with uncertain trend direction? It could be actually when you are facing Megaphone patterns or price patterns are widening. Instead of repeating mistakes, it is better to take advantage of the appearance of this rare price pattern to make a profit. 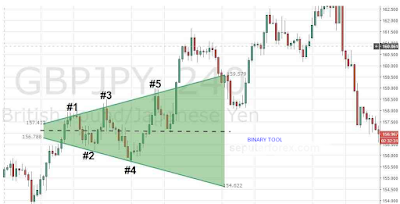 What is the Megaphone Pattern? The Megaphone pattern is a price pattern with the main characteristic of the Swing High series with a high value of climbing (Higher High) and Swing Low with a lower value (Higher Lows), so a price pattern appears that looks like a loudspeaker instrument. This pattern is seen from price movements when volatile market conditions are high without clear trend direction. From the EUR / USD chart above, it appears that the price forms a Swing High and Swing Low alternately. The next swing is stronger than the previous Swing so if Trendline is placed on each Swing, a Divergent Channel will be formed. What does the Divergent Channel mean? When you draw a line to connect High levels and one more line to connect Low levels, then the result turns in a different direction; that's the Divergent Channel. Because of its distinctive shape, the Megaphone pattern is also known as the Broadening Wedge pattern or the price pattern widens. At first glance the shape will be similar to the Triangle pattern, only the direction is reversed (widened) and appears less frequently. Even though it is rarely seen on a chart, the trading opportunities of this price pattern are quite promising because traders will get a signal to buy at the lowest price, or sell at the highest price (reversal). What is the Trading Strategy with Megaphone Patterns? In this scenario, the price is expected to reverse after touching the Divergent Trendline. For example, on the fourth Swing point, a position can be opened after the price starts touching the previous Swing level. After the position is open, the profit target (Take Profit) can be placed near Midline or further on the next Swing point. While the Stop Loss is placed a few pips above the last Swing. After the fourth Swing reverses direction, usually the next Swing has the potential to breakout or break the Trendline limit. For this scenario, the position is opened after the price closes at the Divergent Trendline's outer border. After OP, Stop Loss is placed a few pips on the inside of the Trendline according to the previous High or Low Swing. The profit target can be adjusted with good Risk / Reward and Money Management Ratios. From the same chart, the last Swing (# 5) appears to be reversing from its peak, but stops decreasing after reaching the Midline. Next, the price reverses direction to break the trendline's upper border. 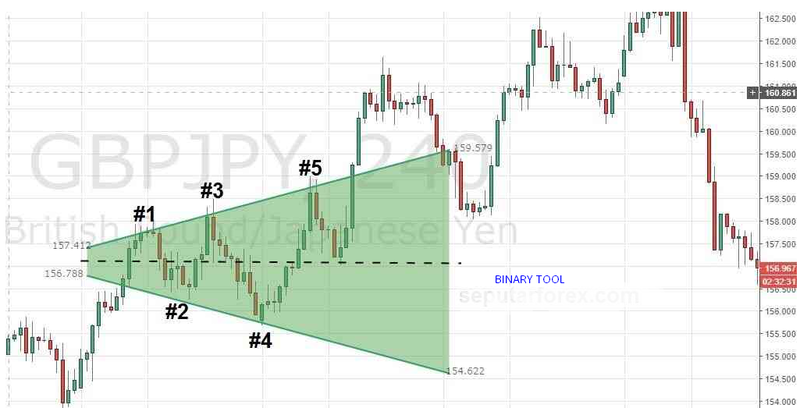 A buy position can be opened when the price closes just outside the Trendline limit. Raed to Doubling Trading Profits Every Day, Is It Possible?